The web is fuelled by images – just look at the popularity of sites like Pinterest and Flickr and photosharing apps like Instagram. Time and again, research shows that Facebook and Twitter updates containing photos are shared and liked more often than purely text-based updates. But it’s not as simple as trawling Google Images for suitable pics to use. You could find yourself facing a serious fine for breaching copyright laws. 2) Commission a photographer. Do check that you’ll have ownership of (and permission to use as you wish) the resulting photos. 4) Contact the owner of copyrighted images you want to use, and ask permission. This may be granted for a fee, or in return for a link back and attribution. 5) Obtain images from a photo library, where you generally pay a license fee for each image you use (but sometimes it’s free). The last option on the list is probably the easiest. Stock image libraries carry thousands of photos, are easy to search and generally charge reasonable fees. Some even have a free images section. But don’t ignore Flickr. The images you’ll find there are generally not as marketing oriented as those in commercial image libraries. Many Flickr users attach Creative Commons licences to their images, and although you need to check, quite often the terms of the licence allows the photos to be used freely (on, for example, a blog) in return for proper attribution. Compfight is a useful site – it’s a search engine for Flickr, enabling you to find images based on the type of license you’re after. 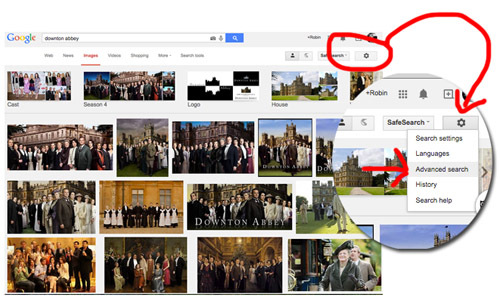 Google Images can still be a useful tool in the search for free-to-use photos. Try the Advanced Search option. 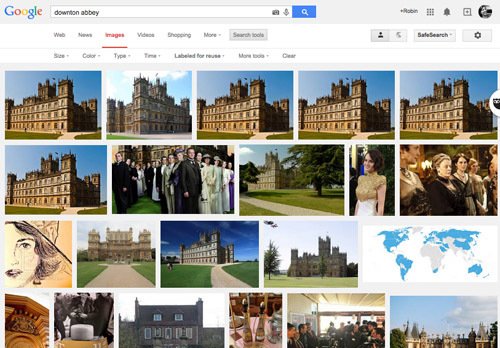 Here’s an example: let’s say I’d like to illustrate a blog post with a photo related to the TV series ‘Downton Abbey’. Unsurprisingly, my first search on Google Images brings up thousands of results. If I go to the cog icon top right, there’s a drop down menu – when click on Advanced Search I get a page of options. Scrolling down I come to ‘Usage Rights’. Here I select ‘Free to use or share, even commercially’. However, there are flaws with this – images can be stripped of their license details, saved and re-uploaded, which doesn’t make them free to use even though Google Images presents them as so being. In this example, one of the Downton Abbey photos, although obviously a still shot from the show, is actually on somebody’s Flickr page. And if I enter this page’s URL into an image recognition engine such as Tin Eye it throws up 156 other pages where this photo appears. Just because a photo is being widely shared it doesn’t mean it’s free to use. Just be aware of that.